Sal Watts, attuned to the voices of the community, heard the message: Why hadn’t someone made a Blaxploitation movie that more clearly reflected what the Black people wanted to see? The result is “Solomon King,” a fast, hard hitting drama currently at the Baldwin Theatre, starring Sal Watts in the title role. He also wrote, produced and co-directed the film, the first by an independent Black producer. A close look at the production credits also reveals that Sal Watts is listed, along with Chuck Colwell, as film editor on the picture. It all began at Oakland’s Channel 20, where Sal Watts formerly hosted a television talk show. As an avid movie-goer, he was in sympathy with the complaints which came into his program about the current crop of Black action films. Gradually he felt that he could make a contribution to the genre from the Black point of view. And once Sal Watts sets out to do something, nothing can deter him. In this case, his mission was to make a quality motion picture. He did. “Solomon King” was shot entirely on location in his hometown of Oakland and around the Bay area of Northern California. It was also cast in Oakland, using both professional and non-professional actors, including baseball’s Tito Fuentes, a personal friend of Sal. In the pre-production stages of the film, Sal Watts was encouraged and guided by the late Mantan Moreland, the gifted Black comedian who was best noted for his role of Birmingham Brown in the “Charlie Chan” movie series. 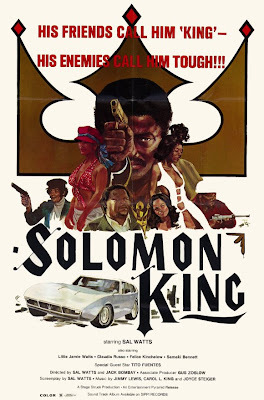 Mr. Moreland was to have been an integral part of the production of “Solomon King,” but his untimely death in 1973 was not only a great loss to the film but to movie fans around the world. Sal Watts is an uncommon success story. He was born in Mississippi some 38 years ago and, through ambition, desire and stick-to-itiveness, has managed to achieve whatever goal he set out to attain. There are more goals – and films – ahead, as evidenced by the name of his motion picture company: Stage Struck Productions. Take a listen to the SOLOMON KING soundtrack LP here. Tito Fuentes playing himself? I gotta see this. 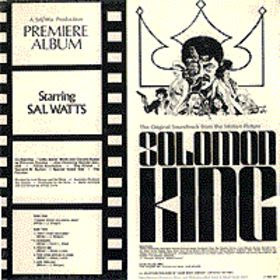 Wait, is Sol Watts playing Solomon King or Solomon King playing Sol Watts? I have this on 35mm and we played it under its other title. One of the daughters of the star approached me online after the screening.. its never been released anywhere from the sounds of it. The print we played is crazy as all hell and appears to be all over the place.. not just reels mixed up but completely bugfuck incoherent. Hi Ant! My name is Keith. Sal Watts is my uncle. I've been looking for that movie for a long time now. Did you ever get a copy? I would love top buy the DVD from you.